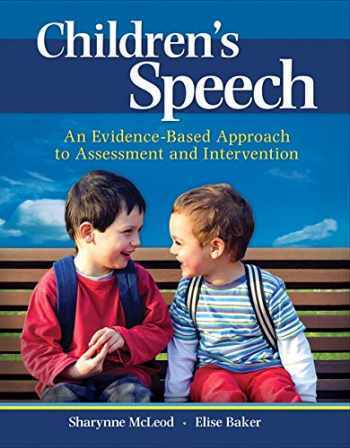 Acknowledged author Sharynne McLeod wrote Children's Speech: An Evidence-Based Approach to Assessment and Intervention (What's New in Communication Sciences & Disorders) comprising 656 pages back in 2016. Textbook and etextbook are published under ISBN 0132755963 and 9780132755962. Since then Children's Speech: An Evidence-Based Approach to Assessment and Intervention (What's New in Communication Sciences & Disorders) textbook received total rating of 3.5 stars and was available to sell back to BooksRun online for the top buyback price of $44.66 or rent at the marketplace. Children's Speech distills scientific evidence from around the world on sound disorders across the areas of speech acquisition, assessment, analysis, diagnosis, and intervention, and presents it with practical knowledge to prepare speech-language pathologists (SLPs) to work with children and their families. The book is guided by two contemporary frameworks that direct the successful management of speech sound disorders in children: evidence-based practice (EBP) and the International Classification of Functioning Disability and Health—Children and Youth (ICF-CY). The foundation knowledge covers important topics including defining the population, types of speech sound disorders, anatomical structures, articulation and transcription of speech sounds, and theoretical foundations of speech and speech acquisition. Practical evidence-based knowledge is covered in chapters that mirror the stages of contact when working with children with speech sound disorders including assessment, analysis, goal setting, intervention principles and plans, intervention procedures, phonological interventions, motor speech interventions, and the conduct of EBP. The last chapter provides comprehensive clinical information for five clinical cases, including transcribed speech samples, case history information, assessment results and other real-life material. Throughout, readers are directed to complete clinical application tasks, drawing on the case-based information in this final chapter.